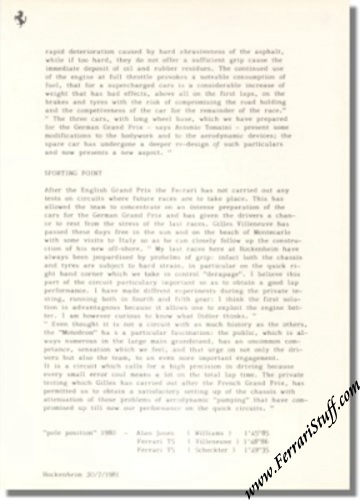 Vintage 1981 Ferrari press release on the Grand Prix of Germany held at Hockenheim. Mentions that Gilles Villeneuve and Didier Pironi will be driving the Ferrari 126/CK turbo cars. 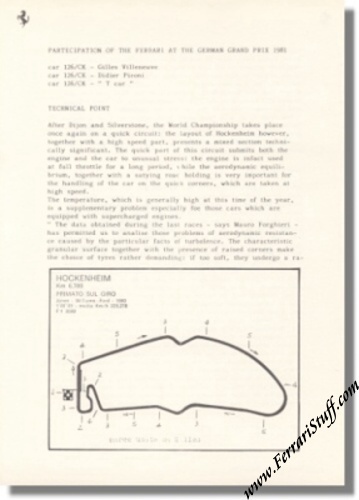 Contains a section with "Technical Point" and one with "Sporting point" + map of Hockenheim with Gilles Villeneuve's gear shifting points. Issued before the race for the motoring press. Didier Pironi had to give up in the very first lap with electrical problems.